My husband, Jim, and I love this song by Richard Thompson and its signature line, “red hair and black leather, my favorite color scheme.” In fact, the first concert we saw together was Thompson playing at the Boulder Theater, and of course, I sported a black leather motorcycle jacket. When Thompson sang the song, one of his most popular, and got to this particular line, Jim called out, “Me, too!” Thank goodness, Jim is not a heckler – and he didn’t disturb the concert – but I loved it! I’m guessing many red-headed women have gone to Richard Thompson concerts in black leather jackets. Thompson’s “1952 Vincent Black Lightning” is a perfect story song. It’s short – just a few stanzas – but it really tells a story and packs an emotional punch in that compact space. There are two, maybe three characters – the thief James Adie and Red Molly, of course, but James’s 1952 Vincent Black Lightning is almost a character, too. When I was a kid, that was always the exotic bike, that was always the one, the one that you went “ooh, wow.” I’d always been looking for English ideas that didn’t sound corny, that had some romance to them, and around which you could pin a song. And this song started with a motorcycle, it started with the Vincent. It was a good lodestone around which the song could revolve. If you want to truly geek out on this amazing song, visit Sing Out! magazine for an incredibly thorough discussion of the way the song has evolved over years of performances, both by Thompson and by other musicians who have covered the song. If you’re not familiar with Richard Thompson’s “1952 Vincent Black Lightning,” take a listen – and see if you don’t get a lump in your throat as James says goodbye to Red Molly and his fine motorbike. You can listen to the song online – but better yet, you might want to purchase Rumor and Sigh , the album on which he released “1952 Vincent Black Lightning,” as there are lots of other great songs on the album as well. If you fall in love with Richard Thompson’s music (and really, who wouldn’t? ), you might want to add RT: The Life and Music of Richard Thompson , a five-CD box set that features classic, rare, and previously unreleased Thompson recordings. And if you want to learn to play like the fleet-fingered Thompson, check out his book Richard Thompson Teaches Traditional Guitar Instrumentals: Unique Arrangements of Irish, Scottish and English Tunes . 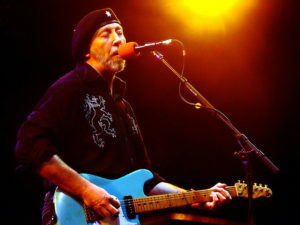 Image Credit: Richard Thompson performing in 2007, photo by Anthony Pepitone, used with permission, https://commons.wikimedia.org/wiki/File:Richard_Thompson_-_6-21-07_-_Photo_by_Anthony_Pepitone.jpg.